SmartGardener.com is the easiest way to plan, grow and harvest your own organic garden or community garden. From setting up your garden design and choosing your plants to weekly To Do list reminders, SmartGardener.com is your answer to simple sustainability. Kristee Rosendahl, Founder, CEO and Product Designer believes strongly in mainstreaming sustainability. Set up your Garden - Once your settings reflect your growing conditions, you can layout the size and shape of your garden beds. Select your Plants - Select from multiple ways to find your plants in an extremely rich database of over 500 plants - browsing, filtering and recommended plants just for your garden. Create your Smart Garden Plan - Get a Plan created just for your garden based on your plants, layout and growing conditions, complete with a complex weather mapping algorithm. Receive your Weekly To Dos - View your prep, plant, care and harvest To Dos all in one place and receive them weekly in your email too. EB - Did you grow up gardening or was it something you got into once you were out on your own? Kristee - My grandparents always had a garden. My mother is also an avid gardener now. Growing up I was around it but I didn't really garden until I had my own places to do it in. I went to go get a degree in architecture at Stanford but they closed that department down. I ended up getting a degree in graphic design. That turned out to be a good thing because I went to work at Apple Computer where design was a very important aspect of that whole experience. I worked there from 1984 to 1991. In college I had this intensive garden outside of the house I rented. Being outside is such a break and release from the other things we do. 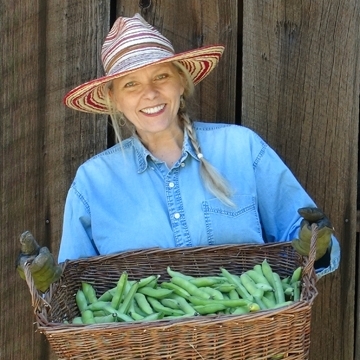 Moving to a place like Sonoma County was a way to get some space to do some gardening. I inherited a 450 sq foot garden but I was not in any way a seasoned gardener when I started that and I am not a master gardener today. I am just trying to get it to work. We do sell some of our fava beans, onions, tomatoes and garlic to restaurants around here which gives us have all sorts of appreciation for farmers. It's hard work for little money. EB - If someone is just starting a garden for the first time, what are some easy items to grow? Kristee - There are some standards. People talk about radishes, which are great because they grow really fast and are fun for kids too. Leafy vegetables as well as chard, will go crazy if you let them and here it will grow through a winter. The two that everybody talks about because they are so prolific are zucchini and cucumbers. They are pretty hardy and give you lots of produce for your efforts. EB - What are your top 3 tips for growing a garden? Kristee - 1. I would say the first tip would be to not overdue it your first year. Narrow the choices. We get so excited, and it is relatively easy to buy starts, but it just overwhelms people when they grow too many things. Doing something reasonable the first year is good. About 100 sq feet per person is the general rule, but that may be too much for some people. If you are doing intensive gardening, it's about 50 sq. feet per person. I would say start there. 2. Grow what works for you in your area. You can go to our site and put in your zip code and what we give you instantaneously are your growing seasons to help you pick the right plants. It helps you understand that if you have a tomato that needs 75 days of warm weather, and your area only has 50, you better try something else. We have a "Recommend Plants" tool which also helps you see what works for your specific conditions. We will recommend how many plants to plant in relation to how many people are in your family. 3. It is fun and easy to start a garden, but the maintenance is a different kind of effort. What you do week to week has the most impact on the quality of what you are going to harvest and eat. That is why we also have "Weekly To Do" lists for you on the site. We make it easier to know what you need to do on a regular basis to optimize your garden. A big part of maintaining your garden is just being out in it on a regular basis. Visit it, hang out in it, pull a couple weeds. You will start to see what is and is not working. This little bit of work at little intervals makes it much more doable, less overwhelming and more fun than a whole day of weeding. EB - Do you have any tips for natural pest control in the garden? Kristee - This is one of the things that we really emphasize, being a service about organic gardening. The main thing is that you have to start off by growing healthy plants because they can fend off pest or disease much easier. What we also do on the site is talk a lot about maintaining a healthy soil (also helps reduce problems) and we have a whole preventive pest and disease reference section. In my garden, protection is also something we are just getting into because we got a bad case of cucumber beetle last year. We'll use those thin fabric covers that keep a lot of things from getting onto the plants and starting a whole cycle of bugs. Once the egg-laying season is over you can remove it. Companion planting is also something that helps. This is why you will see marigolds in people's vegetable gardens because they do a good job of warding off bugs. EB - What are your thoughts on GMO's? 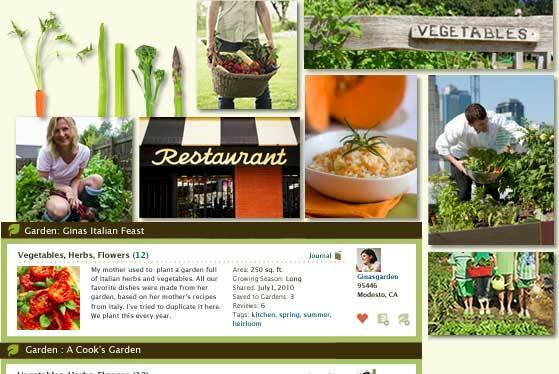 Kristee - There is a reason why we have a site about organic gardening. When we chose seed partners, we picked them for a number of reasons, one very important one was that their products were not tainted by being genetically modified. We only offer GMO free seeds. GMO is such a very short-term way of thinking in terms of growing mass crops, and the long term impact of that is absolutely devastating. You are impacting everything that everyone else around you is growing as well. That's heinous. It obviously puts the future of food into very few hands. GMOs are also impacting our bodies and health. We really have no idea how many of our foods contain GMOs. I 'm looking forward to the day that it has to be disclosed on the label. EB - So what direction do you see Smart Gardener going? Kristee - For one thing, we are more than a gardening planner. We want to help you grow great food from "plot to plate". What happens when you grow all of this wonderful produce? It's about harvesting it, preserving it, cooking and eating it. Let's partner with some great brands to send you great recipes for the things you are growing right when you are harvesting them. How about pre-made gardens you can use that are designed by Deborah Madison, Alice Waters or Jamie Oliver and then include their great recipes for cooking specifically with the ingredients from that garden? Another goal is to start focusing Smart Gardener at the regional and local level. We think it would be great yo have people interacting with others who have the same growing climate as they do. When you are growing food in a particular climate, you want to talk with other gardeners who have the same growing condition as you do. That's why we are going to offer a forum for discussion that is organized regionally. It's also at the local level where important conversations about our food and it's future naturally take place. We can see that the people who use our product want to feel that they are doing a good thing for their family and the planet. All of us using Smart Gardener believe that each of us having a garden will make a difference. Is it accurate to say that you are enamored with developing your own particular vegetables however has a restricted space for your garden? You don't ave to stress. With plentiful arranging, you can take in some accommodating tips on the best way to develop vegetables in little spaces. As an entrepreneur you know it's vital to spend a decent piece of your opportunity arranging and developing your business. A lot of that time is likewise spent gathering and investigating data from different industry specialists. Here's a basic arrangement. I find a very good website for the tow truck Scottsdale AZ, If you want you can visit this site. Great post and article! I'm trying to grow some veggies in my garden but have to hire a stump removal service in Orange County first to get all the stumps removed! It is a great article, I really appreciate it, Thanks for sharing your article.